I also created all my maps with the plain old Paint. The way to get it done pretty fast was to take a memorizable path through the game while taking the screenshots and creating the map directly after playing a section so I always knew where the text part went. Otherwise you might try to use a tool like the Screenshot Autosticher by maxim. I also always dreamt of such a tool, this was basically the reason I stopped making maps because I wanted to create the ultimate stitching helper tool. But I never got anywhere because I couldn't figure out programmatically which part of a screenshot belongs to which of the many parallax backgrounds. The biggest problem for me is the missing ability to separate all the layers with a simple button press. So also congratulations on completing these maps, G.E.R.! For the original Xbox, I only played a handful of exclusive titles so basically I would have to write them all down. It took me a bit to find your appearance: For anyone who watches the whole "Nintendo Quest: Power Tour! [Documentary Series]", Jon appears in the final episode, episode eight. I must have known VGMaps for at least 12 of these 13 years, because I began making my first submitted maps for Commodore Amiga's Aunt Arctic Adventure in 2003 and the inspiration for doing so was this site. I also don't think Walk through walls alone makes it completely irrelevant work. For my Secret Of Evermore maps where I also had a walk through walls code, it still was much work because of the big number of maps and sometimes I had to wait for water/lava effects to have a specific cycle state so they would look the same on the full map. And I merged the screenshots all manually. Nice work with these maps. The labels from Paco also fit. Those maps look really nice. They remind me a little bit of maps that I've had for the Playstation 1 Tomb Raider games by John T Burt, but those Mario 64 maps are even greater because you kept some of the perspective. When I was working on the Game Boy Color version of Tintin in Tibet, I also thought of doing the big counterpart. But I didn't feel like playing the same game again so short after to map it, too. So it never worked out. But it really is a very beautiful game that deserves maps. And also the Temple Of The Sun part. Sadly my daily time is already overfilled with other completely unrelated things and I don't feel like starting with a mapping project at the moment, so don't count in on me. These maps are very special because they show that even newer or the newest 3D games can be mapped with the right tools (no screenshot pasting possible here). Most games do not really use the third dimension thoroughly so it can be displayed fine on a 2D orthographic/axonometric projection map with minor trade-offs ((half)invisible walls in one direction). Exceptions are games like Super Mario Galaxy, Prey, Gex 3D or Descent where there's no clearly defined "up" direction in many areas. June/July, August/September: Little Samson has a dragon, Wonder Boy III's subtitle is about a dragon. And dragons are, in comparison to armored horses, flying armor. June/August: Both have giant staircases compared to the rest of the world. In my Secret Of Evermore maps, I used splitscreens for the parts that changed after returning to early locations with a flying vehicle obtained late in the game (Windwalker). 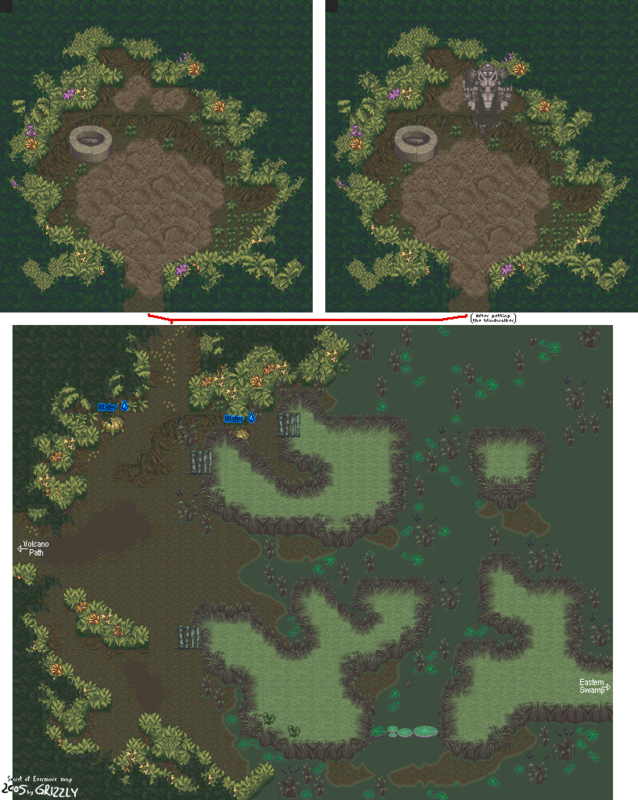 For example on http://www.vgmaps.com/Atlas/SuperNES/SecretOfEvermore-Prehistoria-WesternSwamp.png. For very small changes, I added them directly into the original maps.